Smart Elbow® deflection elbows replaced conventional sweep elbows, reducing maintenance cost and downtime. 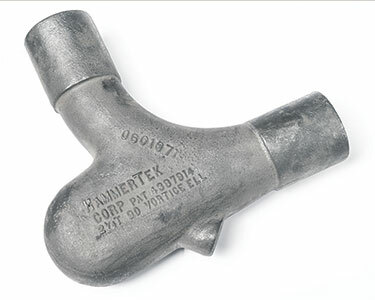 Gasketed couplings connect pneumatic lines to the socket-weld deflection elbows. 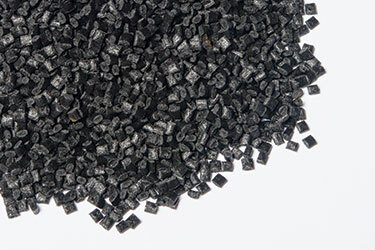 Abrasive wear from glass-fiber-reinforced polypropylene pellets impacting the wall of sweep elbows was prevented by installing non-impact deflection elbows from HammerTek Corp.
Abrasive, glass-fiber-reinforced polypropylene pellets are conveyed pneumatically into the manufacturing plant from silos. No blowouts have occurred since replacing conventional sweep elbows with Smart Elbow® deflection elbows. The elbow’s short radius, vortex design features a protruding spherical chamber that causes a ball of material suspended in air to rotate, gently deflecting incoming material around the bend without impacting the elbow wall or generating heat. 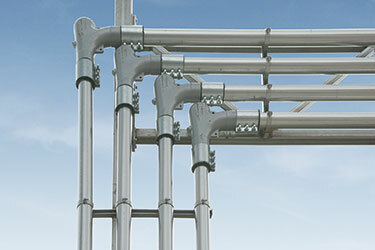 Banjo Corporation manufactures fittings, couplings, valves, pumps and other industrial and agricultural liquid-handling products from tough fiber-reinforced polypropylene. 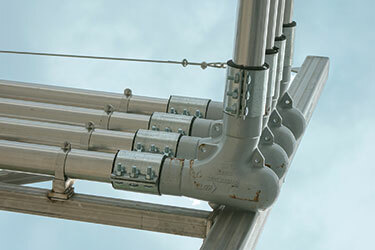 Crawfordsville, IN — Banjo Corporation solved problems of wear and blowouts in pneumatic lines conveying reinforced polypropylene by replacing conventional long radius sweep elbows with 90 degree deflection elbows from HammerTek Corp., yielding a six-month ROI. 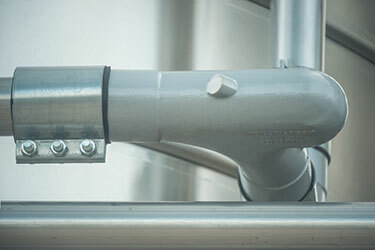 Banjo manufactures valves, fittings, cam lever couplings, pumps, and various other industrial and agricultural liquid-handling products in a dedicated manufacturing facility in Crawfordsville, Indiana, and ships to customers worldwide. The company operates 36 injection molding machines with capabilities of producing plastic products as diverse as quarter inch pipe couplings to large format centrifugal pump bodies. The polypropylene that Banjo molds is custom compounded to achieve maximum durability. The resin, says Derek Thompson, maintenance department manager, "is almost indestructible. 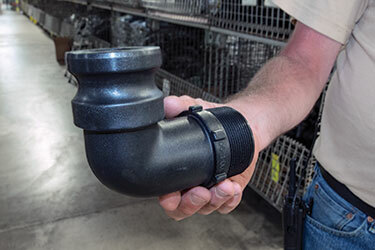 You could use a pipe wrench to connect some of our finished fittings and never damage them." This toughness comes from the 20% or 40% fiber-reinforced polypropylene with which the parts are molded. But the fiber reinforcement increases the pellets’ abrasiveness to the point where they were wearing through the elbows of the pneumatic conveying lines, causing cracks, holes and sometimes blowouts. One spill in particular occurred with a conventional elbow on a line from an outside silo to the injection machines. A one-inch (2.5 cm) layer of resin blanketed part of a roof. "We had to sweep it up, empty the pellets into a bucket and rope the bucket down to the ground," Thompson says. "It took several men four or five hours to clean it up." Thompson concluded that conventional sweep elbows, including those with ceramic, porcelain and other types of hard linings, become weak points in pneumatic conveying systems that move large volumes of abrasive pellets. Thompson sought to prevent future blowouts after two long sweep elbows on top of Banjo's 60 ft (18 m) high silo developed holes from the abrasiveness of the 40% glass fiber-reinforced PP pellets. "I researched and found that the Smart Elbow® deflection elbows from HammerTek were much more durable than even porcelain-lined versions. We bought the first two in 2009," Thompson says, "and they lasted eight years before needing replacement." The company has since installed a total of 24 of the deflection elbows and associated couplings. Unlike conventional sweep elbows in which material impacts the elbow wall to change direction, the Smart Elbow design features a spherical vortex chamber protruding from the 90 degree angle of the elbow. 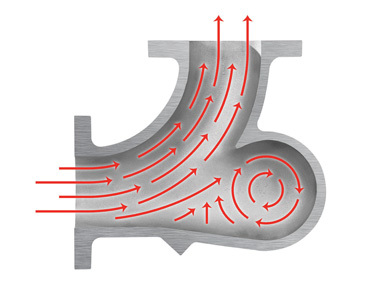 When pellets enter the elbow, a portion of the flow is automatically diverted into the chamber, where it forms a loosely packed ball of material that rotates slowly in the direction of flow. This rotating mass prevents incoming resin from impacting the elbow wall, instead cushioning and deflecting it around the bend, without impacting the elbow wall. Instead of exiting at the outermost radius of the elbow as with conventional sweeps, material exits the deflection elbow in a laminar, non-turbulent pattern spread evenly across the outflow. "The reduction of flow turbulence as resin moves through the 90 degree deflection elbows also reduces the noise of conveying operations," says Thompson. As soon as the material infeed is stopped, the pellets evacuate the vortex chamber and are conveyed downstream. 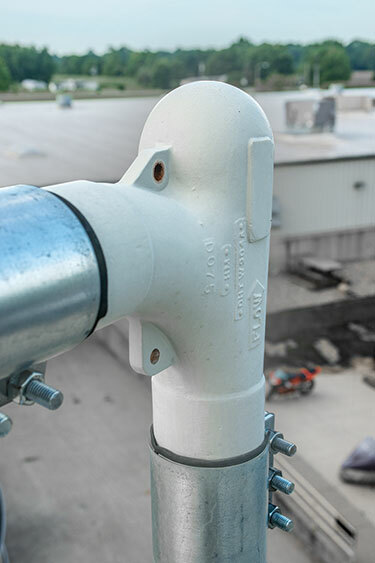 The 24 deflection elbows installed are cast of ductile iron, and connect to pneumatic lines using a coupling and gasket designed to last the life of the elbow. Eighteen are 4 in. 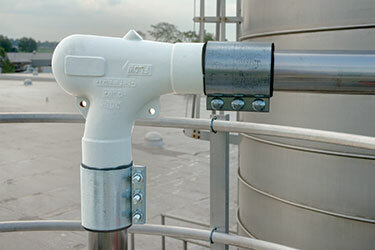 (100 mm) diameter elbows on pneumatic pipes that run from four silos into the main plant. Four 2.25 in. (57 mm) diameter elbows are installed on inside feed lines to the injection molding machines. Two 6 in. (150 mm) diameter elbows are on lines that transport granulator scrap from the production floor to a storage area. Banjo's main silo stands 60 ft (18 m) high; three others each stand 30 ft (9 m) high. A 4 in. 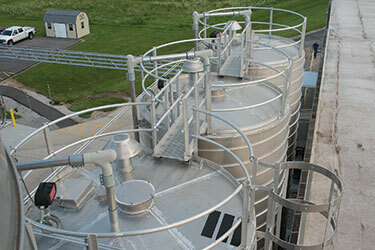 (100 mm) pneumatic conveying line descends the side of each silo and then makes a 90 degree connection and runs horizontally for approximately 100 ft (30.5 m). Each line then makes another 90 degree drop to connect with four indoor surge bins, from which four 2.25 in. (57 mm) diameter pneumatic lines distribute the resin pellets to the feeding banks, and then to the injection molding machine hoppers. The 60 ft (18 m) high silo contains 40% reinforced polypropylene, and two 30 ft (9 m) silos hold 20% glass filled PP pellets. The fourth silo holds “white ball material”, i.e., neat, or unreinforced, polypropylene. 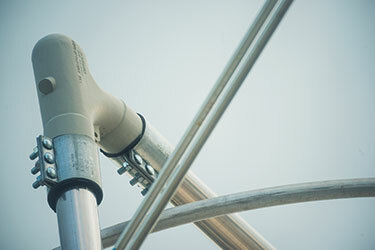 Although this resin is much less abrasive, the HammerTek elbows were still installed on its feeding line. The 60 ft (18 m) silo holds four truckloads of resin, each truckload weighing 40,000 lb (18,144 kg). Thompson says as much as two truckloads per day can be delivered. Transferring resin from truck to silo takes four hours with a vacuum pump that runs off the truck’s power. The company now keeps its injection molding operation running at high throughput rates without interruption. Thomson says that compared with conventional sweep elbows, the reduced maintenance costs, reduced downtime, and fewer replacements yield an ROI of approximately six months. In addition to the Indiana facility, Banjo, a unit of Idex Corp., operates plants in Brazil and the Netherlands.